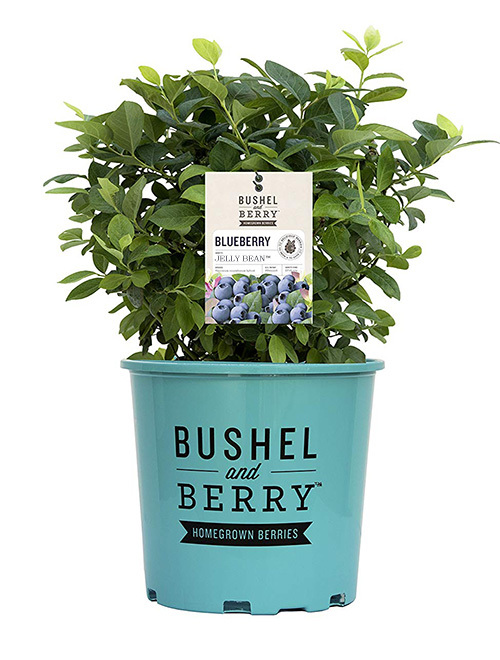 Bushel and Berry™ Jelly Bean™ Blueberry – The Perfect Berry Bush for Small Spaces | Faddegon's Nursery, Inc.
Apr 5, 2019 | Blog, What's New? Jelly Bean® has large, flavorful blueberries mid-summer that taste like sweet, homemade blueberry jelly. The foliage is unlike other blueberries and has unique, elongated green leaves with highlights of red in cooler climates. Try a mini-hedge along a pathway, in the landscape or in decorative patio containers. If planting in a container, keep well watered throughout the growing season. In fall, you can plant your Jelly Bean™ directly into the ground. If you want your blueberries to live in containers again next year, either put them in an unheated garage or follow these steps: Wait until plants have gone entirely into dormancy. Plant them in the ground in a good-sized hole. Fill in with the same soil you removed (don’t add food or compost as you would with a new planting). Water once and forget them until spring when you can re-plant in containers.